shown striding forward with the head held high, the neck rising in a high arc and the mane neatly combed to either side, dressed for parade, with a thick braided cord tied just behind the head suspending a large tassel hanging over the chest above a row of floral-decorated teardrop-shaped tassels on the chest strap, the crupper strap hung with four-pronged foliate ornamental trappings, the elaborate bridle with studded and palmate decoration showing traces of bright green pigment, with the notched ears pricked up in an alert attitude and with a tuft of hair drawn up to a high crest between the ears, the layered saddle blankets flaring out to either side and showing remains of green pigment, draped with a pleated cloth gathered into an ornamental knot painted reddish brown and showing remains of a pattern of rings and floral motifs overpainted in white, the knotted ends with traces of orange pigment, the blanket under the saddle painted with crimson pigment, the gray pottery body covered in white slip showing through the rust brown pigment all over. The modelling of this horse is closely related to the Northern Wei sculptural style, with an added bulk and robustness which makes it stronger and more realistic. 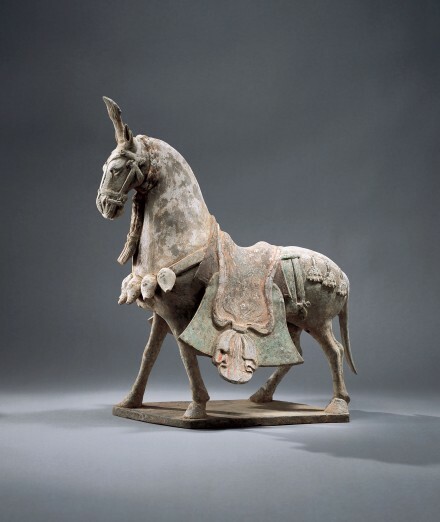 A very similarly modelled and decorated figure of a horse shown standing foursquare, excavated in Cixian, Hebei province in 1979 from the Eastern Wei tomb of a princess of the Ruru (Ruan ruan) nationality, is illustrated in Wenwu, 1984, No. 4, pl. 5:2, with a line drawing on p. 6, fig. 7:3. Another similar example of a painted pottery horse, shown standing foursquare and elaborately dressed with very similar trappings, was also excavated in Cixian county, Hebei province, in the tomb of Gao Run who was buried in the Northern Qi dynasty, illustrated in Kaogu, 1979, No. 3, pl. 8, fig. 2, with a line drawing on p. 240, fig. 6:1.